The Eleonore Jeans. I’ve made this project before and love the results, but finding a good stretch denim is sometimes hard. I stumbled across this Vivid Pink stretch denim at Emma One Sock awhile ago and couldn’t resist picking it up. The Rebel Choker. I recently made a version of this top and loved it so much I decided to make another. I had a strong urge to do this one in camo, but finding what I wanted was difficult (lots of French terry and sweatshirt materials), but stumbled across a double brushed poly bundle listing at SoSewEnglish fabrics for 4 yards for $20 and grabbed one. I now have plenty of left over material to work on other projects too. I recently saw a cute Cricut project for a cassette tape tee. Then I stumbled across this print at Joann’s and decided that I had to make a shirt with both of these elements. For this project, I’m using my favorite men’s pattern, the Nico, the cassette tape print, and a gray remnant that I found in my stash. Last year I bought a cool Dem Bones panel (with has an almost x-ray looking skeleton torso with a front and back panel view) from RikiPedia Wear with the intent on making a cool sweatshirt\hoodie for Halloween and a concert we were attending. I got sidetracked and it just never happened. Since October is right around the corner, I’m not letting this one sit in the stash another year so I’m using the Jalie Hoodie pattern to finally make this happen. 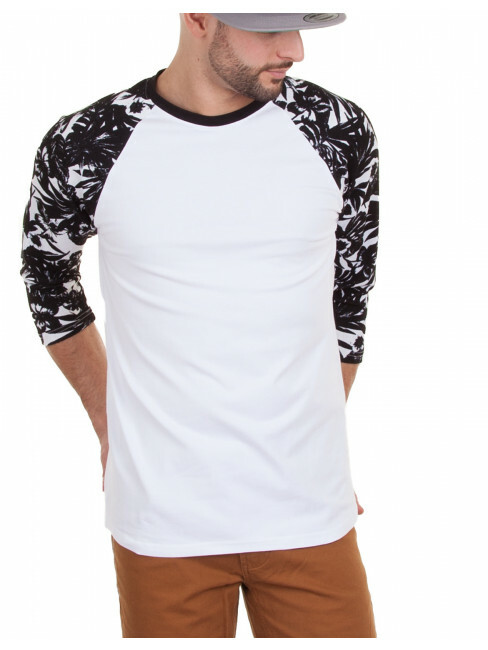 Someone had recently posted about a raglan shirt that they had wanted to make using a teal\pink floral print with a black body…. and I fell in love. Honestly, I had never thought of that fabric combination before (I had actually purchased that exact print from Knitpop this spring along with a matching pink material instead) so I’ve decided to give it a whirl. 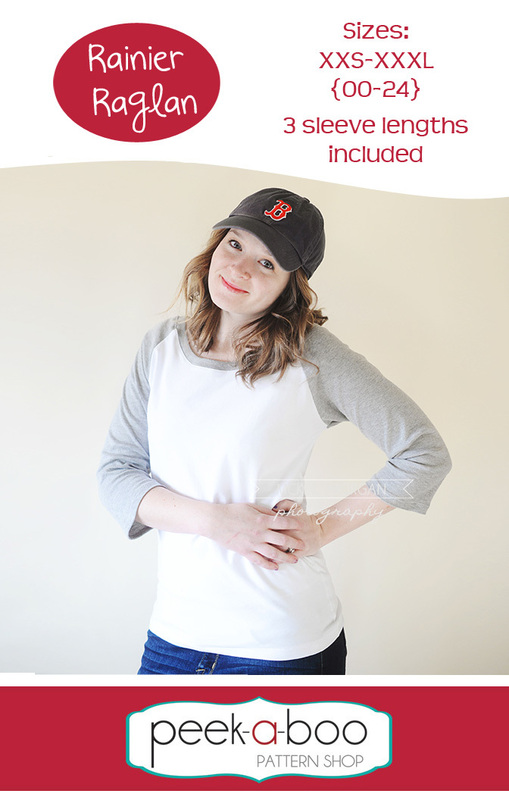 For this one I’m using Peek-a-boo Patterns Rainier Raglan and a solid black jersey (although it feels much thicker, but I have no idea where I got it from) that I found in my stash…. I’m thinking I originally purchased it to make yoga pants because it has a much heavier weight than most fabrics I have in my stash. There were a few more that I was inclined to make, but ran out of time to cut… these should keep me busy for awhile anyway! What’s on your cutting table this weekend? This entry was posted in Uncategorized on September 29, 2017 by stacy. 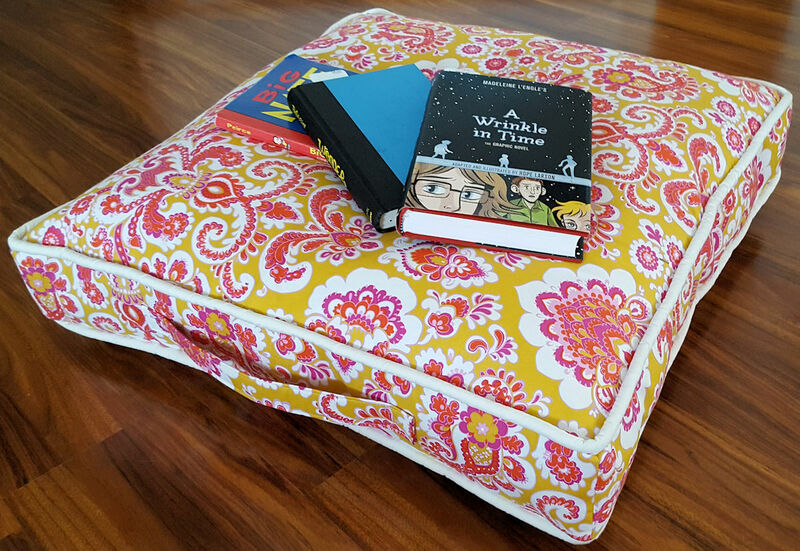 Make your reading spot cozier by adding a reading pillow! Don’t need a floor pillow, but would rather have a tuffet instead? Then be sure to check out this tutorial (beware, math involved)! Get a head start on holiday pajama sewing with these two free patterns for adults and youth – and all version has 3 lengths to choose from. DIY Fluffies is one of my favorite stuffie pattern designers. Win an autographed copy of her book by entering here! 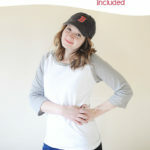 This circle top for girls is a quick way to add a bit of punch to her wardrobe. Plus it looks easy enough to modify for adults. I stumbled across this Digital Device Sleeve and now I totally want to make one. Need something smaller? Try this phone wallet instead. 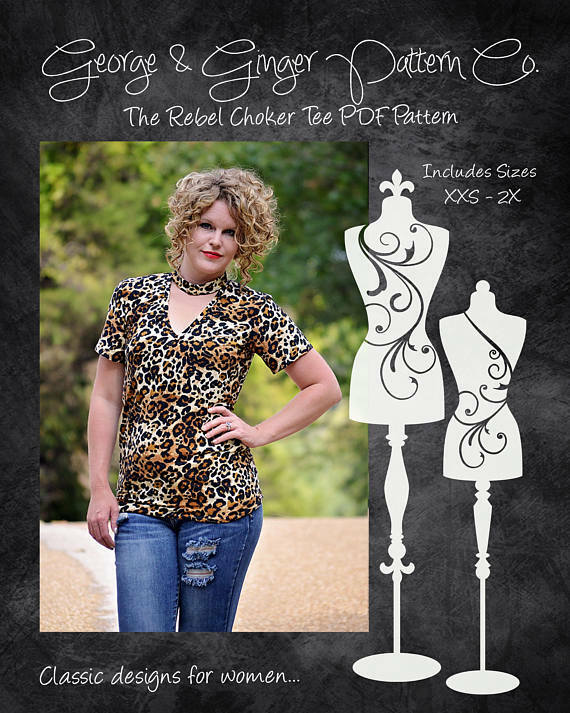 If you have a cutting machine then you won’t want to miss this free Halloween “lace” design that’s the perfect addition to tanks and tops. I’ve been seeing lots of rag rugs lately, so this easy bag seems right on trend. Want to make this for yourself? I found rag rugs for $5 at 5 Below. Winter is coming…. so you’ll definitely need this faux fur jacket. Not only does this blanket upcycle wool sweaters, but denim jeans too. Looking for something more conventional? Then try out this fuzzy sherpa and faux suede tutorial instead. This entry was posted in Uncategorized on September 28, 2017 by stacy. Awhile ago I had the opportunity to test George & Ginger’s latest patterns, The Rave and Riot (released this week). 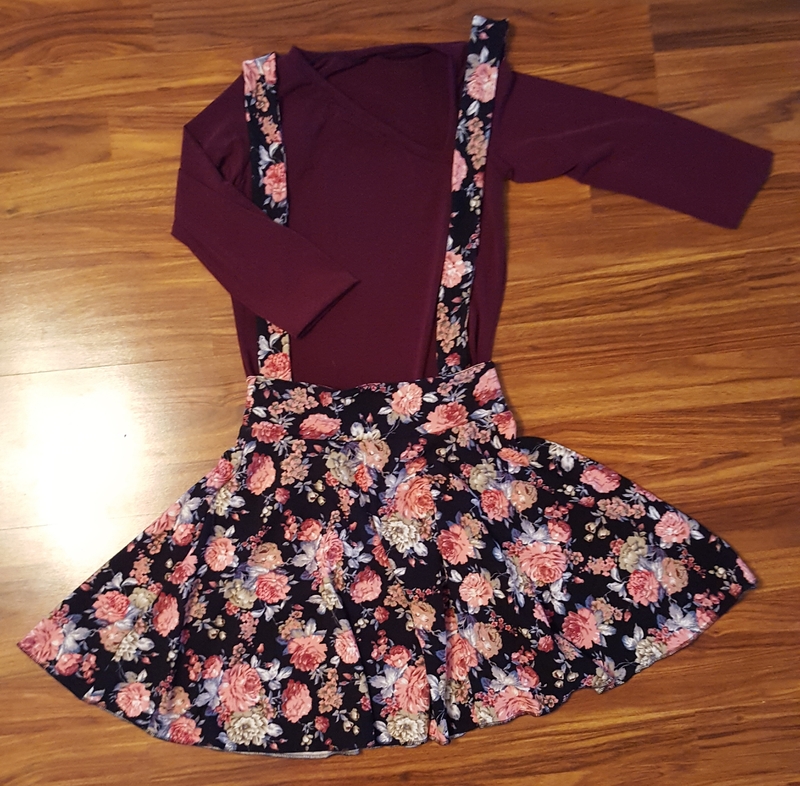 It’s difficult to see from the photo, but I tested the angled neckline with 3/4″ sleeves and the mini skirt version of the dress. I will admit this was a fun little make, but my problem really was with the fabric – Liverpool. While it is listed as a fabric choice for this pattern, I’m not really sure that I would recommend it. The pattern really needs a fabric with a bit more structure and Liverpool just doesn’t have it. I added a bit of interfacing which helped, but it did make the waistband less stretchy so this skirt is really difficult to put on. The top is also very cute, but the details get lost with the suspenders portion of the dress. My advice? Make the fitted skirt with the flounce (with or without the suspenders, this was a super cute look on everyone) in a stretchy ponte and pair it up with the square neckline shirt… save the angled one for when you can show it off! And please, please, please, skip the Liverpool! This entry was posted in Uncategorized on September 27, 2017 by stacy. If you have an elementary\middle school child, chances are one of your homework requirements is to spend 20-30 minutes each night reading. It’s always so much more enjoyable to sit down with a good book when you have a cozy spot to snuggle into…. which is where my latest WeAllSew tutorial comes in: making your own reading pillow! My reading pillow measures 25″ and features grab handles at both ends (making it easily portable) and optional piping. It’s the perfect size for sitting or laying and can even be used as a dog bed (because if you scroll down through to the end of the tutorial, you’ll notice that our dog loves this pillow too). This entry was posted in Uncategorized on September 26, 2017 by stacy. 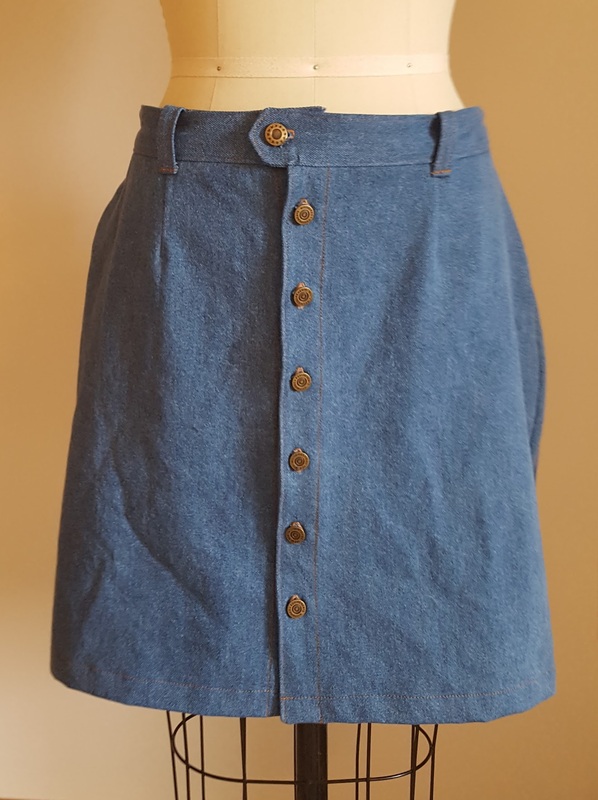 Recently, Taylor needed a denim skirt to wear. She had looked at stores and everything was way too short, so she asked me to make her one. While pattern surfing, we stumbled across the Leonora from Seamwork – it was perfect…. so we thought. The only modification that we made to this skirt was the omission of the pockets on the front. According to Taylor’s measurements she was the perfect size 8 – so I didn’t even need to adjust any of the pattern pieces. Putting the skirt together was easy. The instructions were great and everything went together well. Since I was in a pinch to make this, I wound up getting some of the jean buttons from Joann’s (Dritz brand) and they were HORRIBLE. Only half of them went together well and I wound up having to go back and buy more so I had enough. If I ever do something like this again, I’ll definitely order something else online because this brand was waste of money. Sadly, the fit on this is HUGE. My dressform is a size 8 and the waistband slides down to the top of the hips, which is exactly what it did on Taylor. Because I had pre-shrunk the fabric already, it wouldn’t shrink down anymore after washing either. It’s also rather dowdy on Taylor too – it’s just not youthful enough for her… I think it’s a cross between the fabric (it needs some distressing or something) and the length (it needs to be several inches shorter). So sadly, this skirt is a wadder. I do think it would be cute in a corduroy and some boots for fall, but the denim (and the sizing) just doesn’t work. This entry was posted in Uncategorized on September 25, 2017 by stacy. I am a sucker for cute coin purses – this one looks like a mini backpack! A great way to show off beautiful trims – embellish a pillow. Need a great project for fall? Upcycle old blanks and turn them into crochet pumpkins. No blankets? No problem! Make them from fabric instead. Organize your workspace with pretty hanging organizers. After you’re done checking out this project, be sure to enter to win a zipper quilt pattern and jelly roll. This girl’s t-shirt dress isn’t just easy to sew, it’s a great wardrobe staple! I love bucket bags because it’s an easy way to show off hardware and bold prints. Love to refashion? Here’s 5 great thrift store hacks to try this fall. Camping with kids? Then you’ll want to check out this pillow tutorial. This has nothing to do with sewing, but I really want to make these Cheesy Pizza ornaments for the holidays. You don’t see wrap tops nearly as often anymore, but I still love the style. Never worry about tangled jewelry when you travel when you make this accordion style organizer. This Kitchen Aid cover is a pretty way to store your mixer and still leave it out. This entry was posted in Uncategorized on September 21, 2017 by stacy. I’ve been a big fan of Cricut since I purchased my machine a little over a year ago. My original intent was to be able to embellish shirts that I’ve made… however, it’s come in handy for whipping up last minute gifts and I’ve enjoyed making cards and a few papercraft items too. 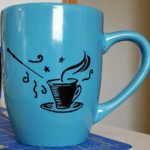 Now Cricut is targeting a new audience – sewists! 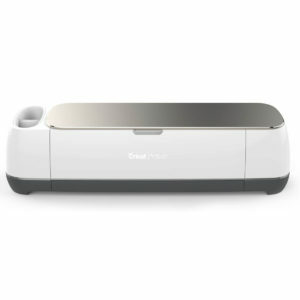 Have you seen the new Cricut Maker? Basically this little machine can cut a wide variety of materials – from chipboard to fabric. They even have several projects that you can purchase (largely Simplicity patterns that are geared toward babies, lots of plush, a few small bags, and quilts). I’ve been very tempted to put this on my wishlist, but so far most of the projects just don’t appeal to me – especially since this machine sports a $399 price tag. What I am anxious to see is what comes next as far as projects go. At some point independents will start designing patterns\cut files and I think that’s where some really interesting projects can be made. And since cutting is my least favorite part of sewing, this may help knock off some time doing my least favorite activity (not to mention that it will be very precise!). So, what about everyone else? Has anyone broken down and gotten this new machine yet? This entry was posted in Uncategorized on September 20, 2017 by stacy. During the middle of the day yesterday, I noticed that it was National Cheeseburger Day – making my post this week very timely! 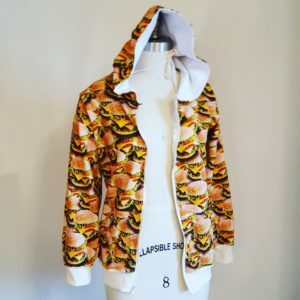 After yesterday’s Royale with Cheese sweatshirt, I thought I should follow it up with Easton’s hoodie. This time around I made the HIgh Five Hoodie, in one size larger than what he is currently wearing so that he doesn’t outgrow it too soon. I made a few small modifications – extending the arm and waistband trims a smidge (because I felt they were too tight, but now may have made them too large, LOL) and adding a bit of interfacing to the zipper area (which made inserting the zipper go so muchI smoother, even the topstitching looks better). Overall, I am super pleased with this jacket and so is Easton. The fit is a bit large (intentionally so he doesn’t outgrow this by spring), but not so much that he can’t wear it now and the print is so fun and crazy, it suits his personality well. Once again, there are no action shots as the weather here is so warm that we still don’t need a jacket – but we’re ready for it when it is! This entry was posted in Uncategorized on September 19, 2017 by stacy. Last week I had mentioned that I was starting a few Beloved Shirts inspired items…. and today I have the first one to show you. 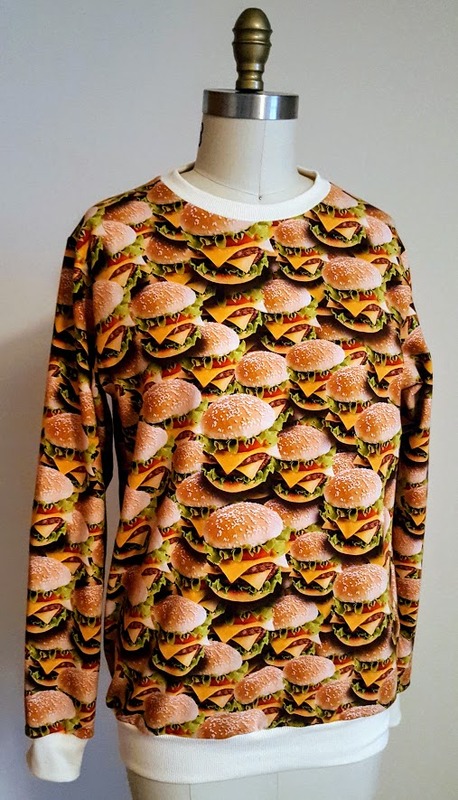 This one is a Jalie 3355 sweatshirt made in an all-over hamburger print with contrasting bands….. my family (except Easton who thought it was awesome we would have “matching” sweatshirts) may be a bit embarrassed that I plan on wearing this out, but I sort of love it. I call it, my “Royale with Cheese” top. Construction on this one was quick and easy. 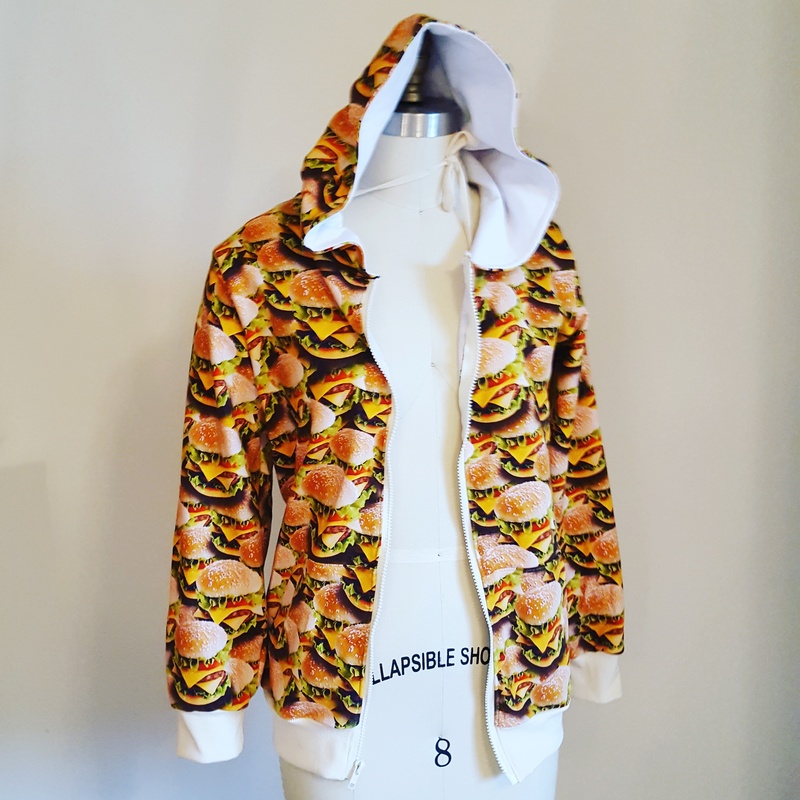 Both the fabric and the pattern sewed up nicely so I had this sweatshirt finished by the end of the morning. The fit is great, but is slightly “fitted” (for lack of a better word) – if you’re looking for something that is a bit more loose, I would suggest going up several sizes for a roomier sweatshirt. Now for a few finishing touches on Easton’s hoodie and we’ll be ready for some interesting looks this fall. This entry was posted in Uncategorized on September 18, 2017 by stacy. When your neighbor picks you up a pizza stone at the store because you told her you were watching artisan pizza videos on Craftsy, you get the overwhelming urge to make something awesome for her. 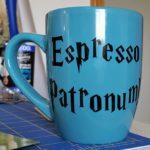 Since she refused to have me pay her back, I decided to give her a unique mug that she can use while she’s drinking coffee and reading a book on her deck in the mornings. 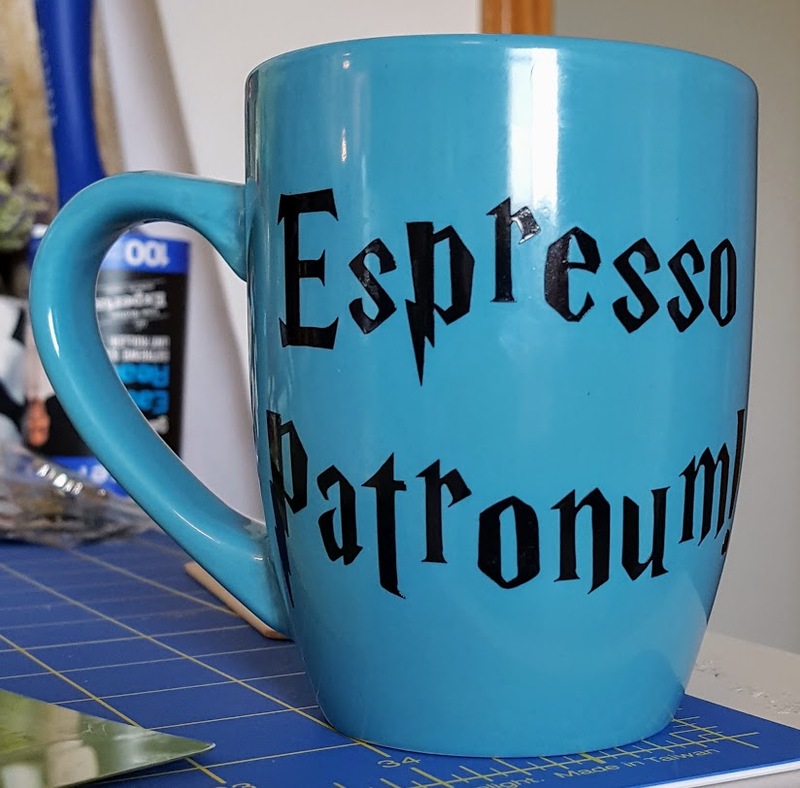 She’s as big of a Harry Potter fan as what I am so I found this Espresso Patronum SVG on Etsy but wound up having to split the design (saying on the front, image on the back) so that everything would fit, be readable, and weed easily. I wound’t suggest going much smaller than this, though. 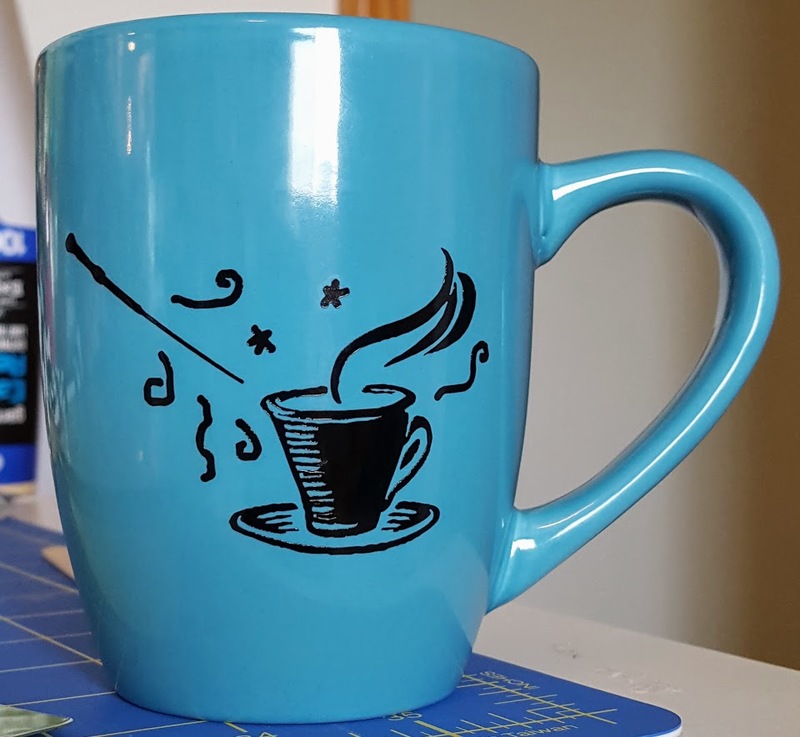 The lines on the wand and cup are pretty fine and a bit tricky to work with. Overall, a fun little project to work on…. I think I may need to make one for myself now! This entry was posted in Uncategorized on September 15, 2017 by stacy.